The Global adhesives transfer tapes market is anticipated to exist USD 10 billion in 2017. Additionally, the global adhesives transfer tapes market anticipated to attain a CAGR of 7% during the forecast period. North America and Europe adhesive transfer tape market are expected to collectively dominate the market throughout the anticipated period on the verge of existing huge retail industry in the regions. The packaging of durable items also demands a significant consumption of adhesive transfer tapes. The existence of various prodigious packaging companies in the region manifests significant growth in the industry. Also, several multinational packaging companies are boosting up investments in Asia Pacific to harness the realized needs of secondary packaging in supermarkets and hypermarkets in the region. Government support towards the industry is also responsible for boosting manufacturing ecosystem with various foods and other readily consumption startups pushing the secondary packaging industry further and propelling the adhesive transfer tape market in the region. Additionally, Asia Pacific adhesive transfer tape market manifest rise in industrialization has resulted in organizational changes and hence rise of many new packaging entrants over the last few years. Many leading companies are focusing towards expansion through retail outlet in the region. Asia Pacific adhesive transfer tape market is primarily expected to be driven by China, South East Asian Countries and India. Latin America and Middle East & Africa are also anticipated to observe a steady growth in forth coming years. 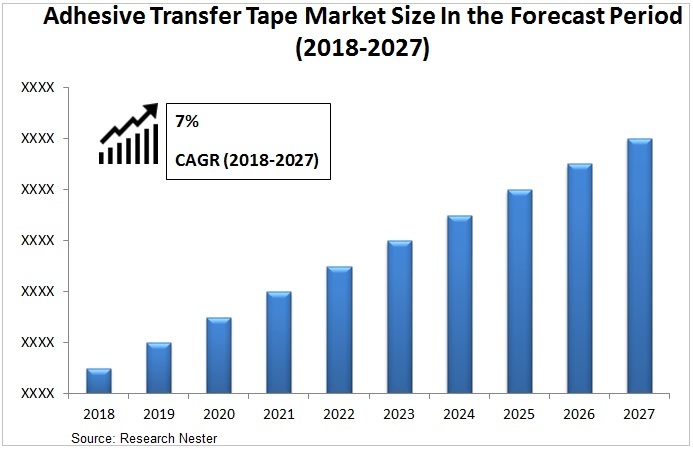 In Latin America, Brazil and Mexico are anticipated to carve new market opportunities for companies indulged in production of adhesive transfer tape.